The Raiders are still tinkering with their roster, even as they gather this week for a three-day mandatory minicamp. On Monday, Oakland signed a pair of veteran free-agent defensive linemen in Ahtyba Rubin, 31, and Frostee Rucker, 34. Rubin, who plays on the inside, is 6-foot-2 and 321 pounds. Since coming into the NFL in 2008 with Cleveland, he’s bounced from the Browns to the Seahawks – where he started every game in 2015 and 2016 – and the Falcons and Broncos in 2017. 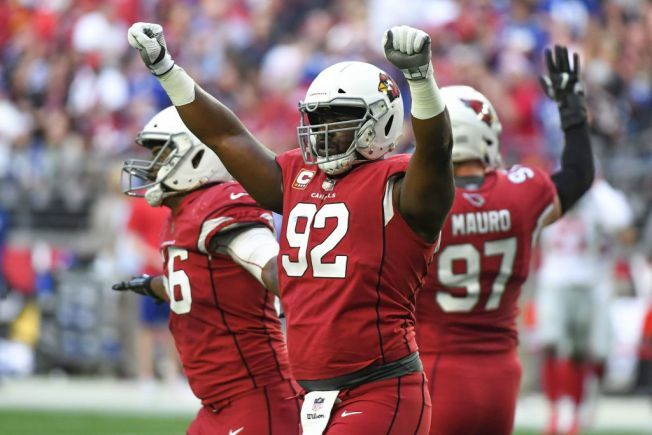 Rucker, who has played both tackle and end, is 6-foot-3 and 270 pounds and started all 16 games for the Arizona Cardinals in 2017, posting 1½ sacks to go with 30 tackles. He played for the Bengals and Browns before joining the Cardinals in 2013. His best season in Arizona came in 2014, when he had five sacks. Both, however, may have trouble making the roster. The projected starting lineup on the defensive line for 2018 is likely to be Khalil Mack and Bruce Irvin on the ends with Justin Ellis and rookie Maurice Hurst at tackles. Also at end are Mario Edwards Jr., Tank Carradine, rookie draft pick Arden Key and rookie free agent Fadol Brown. At tackle are Eddie Vanderdoes, rookie P.J. Hall and Treyvon Hester. As Michael Gehlken of the Las Vegas Review-Journal noted Monday night, Rubin and Rucker add two more 30somethings to a roster that has aged significantly this offseason under new head coach Jon Gruden – who apparently likes to have a lot of veterans in camp. The Raiders roster now has 15 players age 30 or older, 11 of them added since Gruden came on board.